ROAD TOWN, Tortola, VI - Professionals often times associate body art with criminal activity or psychiatric disturbance, based in part on some early descriptive studies some are still trying to make that case. In reality, however, a variety of people, including professionals, clergy, or other respected members of society acquire body art for an assortment of reasons. Nonetheless the extent to which some teens and young adults seem to be going with this form of art is becoming a growing challenge and concern for many employers and they find it inappropriate for certain offices and positions. 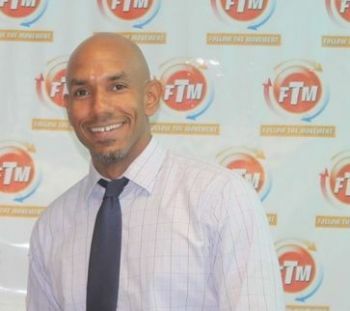 This is a situation that seems to be gripping the youths of the Virgin Islands today and several employers have indicated that on many instances they have had cause to deny employment to several youths, both male and female who were well qualified for certain positions. “This is something that our youths are not seeing no matter how much you tell them, they are piercing and tattooing certain parts of their bodies that are exposed and it is not a professional appearance,” one business entrepreneur told this news site. She said that as recently as two weeks ago she had cause to turn down two of four most qualified persons between the ages of 20 – 32 who had applied to her entity. “They had piercing to the nose, tongue, tattoo on all parts of their hands and one even had a symbolic tattoo to his face and it pained me that I have to deny them the opportunity for a job here and it’s not discrimination, certain jobs you have to have a certain outlook,” said the business woman. This issue was ventilated to the extent that this news site spoke with at least three tattoo and piercing artists who also had expressed concern about the extent youths are going with the art form. 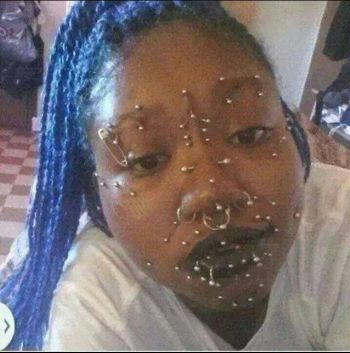 One artist showed our reporter a photograph, the 1# attached to this article, and said it was brought to him by a 21 year old unemployed youth who inquired how much it would take to do that much piercing to her face. “I am telling you she was serious,” the artist said. He said that he immediately closed off his clients for an hour’s break to sit with the young woman and discuss her reasons for wanting to do such an extensive piercing to her face in particular. He explained that he recommended to her that she accessed professional counseling as she had issues of being sexually abused in the home by her father, being bullied at school, called ugly by boys among several other issues. He said that he also asked the young woman if she had a job and with the ‘No’ word being her response he persuaded her not to do it. “I was not going to do it anyway, job or no job,” said the artist. According to the artist lots of youths approach him almost daily for either tattoos or piercing in places and designs that he knows will pose serious challenges for them especially when they go job seeking. He expressed his approval of the step that Follow the Movement (FTM) will be taking tomorrow in making the topic of tattooing and body piercing a subject of discussion at their seminar for young women. 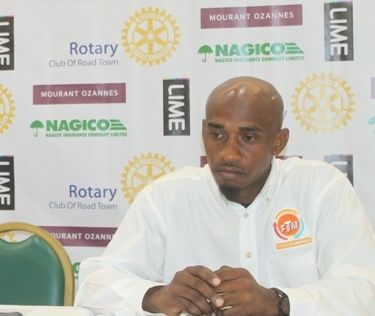 The topic will be facilitated by Mr Julien N. Johnson who is one of several presenters who will address the young ladies at the 'I'm A Lady: Inspire Youth - Build Rotary' seminar which will be held at the ballroom of U.P's Cineplex tomorrow October 16, 2014. Among them also will be a female prison inmate in the person of Ms Shonovia Thomas who will in detail tell the real side of prison life for a woman and why they should not be there. Speaking with this news site, coordinator of the Workshop/Seminar Mr Craig A. Lake aka DJ ‘Push Pop’, said that all is set for the event and was very appreciative of the sponsorship by LIME, Rotary Club of Road Town and several senior leaders of society among others. If the boss don't want you, because of your tatoos, that's their choice. You might not see anything wrong with tatoos, but remember you are the one looking for a job. Look at this picture. Good Lord! Sorry, but if I saw this young woman come in for a job, she would not get it even she is qualified. This gives me the shakes looking at her and there are others just as qualified as she is who I would pick. First impressions means a lot. Whether it is right or wrong, people will form opinions based on such things as tattoos. If you have discreet tattoos covered in the workplace, no problem. If you have neck tattoos or face tattoos, you will struggle to create the right first impression and you better be very good at what you do to impress further. Get a life......wait till something happens to you and then you will change your tune. ... something happen to me? - like being accidentally tattooed or body pierced in a freak accident? What a strange thing to say! Can we call Jerry Spinger?? Bvi society really need to grow up. Tattoos are art n self expression n desire and freedom of expression. What work has to do with tattoos. Grow up ppl if gays are legal what's up with tattoos? Bunch of mumu us!!!! Well start up ur own buisness and that willnt be a problem for. any employee who is underperforming, lazy, rude....should be discriminated against......not because of piercing!! NONSENSE!!! Here we go again with these DINGLE BERRIES and their ultra-conservative an neo-elitist views. Watch any of the television shows these days and tattoos or piercings are the hottest shows. I've lived abroad and worked in professional environments where I've seen CEO's with tatts (visible). Piercings are not permanent first of all. Tattoos can be removed (costly). It depends on what your job role is whether the tattoos or piercings will effect the bottom line of businesses. IMO, if the tattoo is offensive and in a highly visible location then the individual will ultimately know the type of attention that it will draw and the consequences. If your job is client facing (alot of these Financial Services drones are not) then the employer must consider the potential employees' appearance of course. In progressive countries (BVI not included), I have seen receptionists with brightly highlighted hair, fishnet stockings, pierced tongues and ears - but they are the consummate professional nonetheless! Being a "plain Jane" does NOT make you more employable or professional! Look at how many IT/Tech companies have tattooed and pierced (visible) staff that excel beyond their physical appearance! Your a wet tattoo and piercing dream come through!!! I believe you missed the point. The point is it's affect on the "job Seeker". You only have one chance at a first impression and tattoos and piercing affects that first impression. I respect the right of self expression as it is your body but likewise respect that the employer has the right of "a decision" based on what image is important to their business. So as long as their is that understanding then both parties should be fine as each exercise their respective "rights". Know this though, life will not adjust to you, you must adjust to life. I also believe that piercings and tattoos says a lot about the individual and for an employer a concern will be the potential of the individual as in "what will they do next?" and once that probation period is up that employee can get away with a lot as "the horse is out of the barn". So to avoid that, just not hire. Unfortunately one must not judge but if I do not know you all I can go in what I see and before you say a word your appearance speaks VOLUMES. If those persons wish to express themselves with body art and piercing, although taboo to some people, if you have a concern express your concern and keep it moving; its not a challenge! At the end of the day they will make their own decision as to how many tattoos and piercing they want and will risk not being able to get couple of job offers; but that is their business and their right as an individual to take. How about you try to understand those people and learn to accept that not everyone is the same! When are you people going to stop being so small minded.. this will always be taboo to some but not all of our youth feel the same way you feel and they are the future, so don't be surprised 20 years down the road you go to the bank or a trust company and see a person with plenty tattoos and piercing.. people like this around the world, allot of them have big jobs! Do your research! To add to that, with the various social media, hiring managers peruse such sites to get an idea of the type of person that has applied for a job in their organization. While I respect the views and opinions of others, I hate when people like to force their own on you...this place is suffocating dread! This photo is so nasty oh my goodness. Ladies please please dont do this to yourself. I will not hire anyone that looks like that!!! This kind of reminds me of the so-called "Rasta Law" that was imposed on the territory by the powers that be to 'protect' us from ourselves. Freedom of expression, life and liberty along with religion are fundamentals of modern democratic countries. Society is dynamic and ever changing; so too are fashion, work and lifestyles etc. Even leading fashion designers have profited off of the tattoo/piercing industries. Look around BVI how many tatted/pierced individuals are there........? This one looks like a dart board and a bulletin board at the same time. Whether people like to hear it or not that lady who turned down two people did discriminate against them. The way you look has no bearing on getting a job if your qualified. I suppose a person who dresses in Goth would never work in the BVI? really sad to read. We want to be international but refuse to let go the small minded ways of living and existing in the world. Sad. Can you imagine what down there looks like????? Lets get it straight. I am a professional Businessman and I will not hire someone with tattoo or face and noes piercing in my office. I hate the site at looking at it and it just irritates me. O don't hate the worker but the ugly looking art work gets up my sleeves... Take note and be smart. yuck!, tattooed and pierced ppl look disgusting! you can cover up tattoos during work hours and remove piercing just for a job interview vice verse. DISCRIMINATION YES!! especially for refusing to give a job to a qualified individual. people we need to stop follow the craziness of this America. can't we see what is happening over there. the young people need guidance. it's not about letting them live their life but guiding them so that the world would be a better place. television have taken over raising our youths. we need to get them back from those misleading so called stars. secondly it's not discriminating. it's my company or i run the company and if i dont like how u look i dont employ you. so please look like a human being and not a monster from some mad movie. wake up and lets make this world a better place.